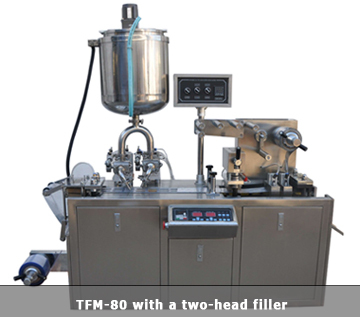 The thermoforming machine TFM-80 is used for forming, filling and sealing of blister packages with various forms and shapes. It is suitable for the packing of products like honey, jam, chocolate spread, etc... More information regarding the working method and overall characteristic of the thermoforming machines can be found here. Double intake ho[[er with water jacket and a mixer for product tempering. All components in direct contact with the product are manufactured from stainless steel. Video 1: Thermoforming machine (blister machine) TFM-80 used for honey. 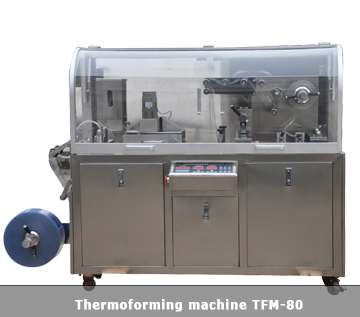 Video 2: Thermoforming machine (blister machine) TFM-80 used for honey.